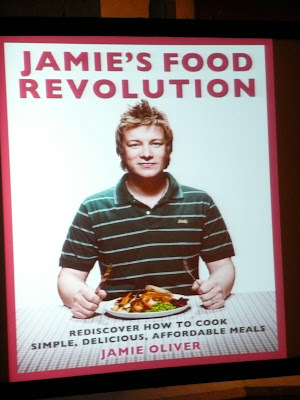 Jamie Oliver in Toronto | eat. live. travel. write. I was fortunate enough to score tickets to see Jamie Oliver speak in Toronto last weekend. Just one day after finishing filming his Food Revolution in Huntington, West Virginia, Jamie spent the afternoon chatting to the Toronto crowd on subjects ranging from how to get your husband to cook to describing his biggest mishap in the kitchen (let’s put it this way, it gives a whole new meaning to his “Naked Chef” title…). On a bare stage (save two armchairs and side tables that he didn’t use), casually dressed in jeans, a leather jacket and a baseball cap, he answered questions for 90 minutes which went by in a flash. The way the event was set up was not the most efficient – with our programmes, we received “question cards” to fill out and hand to the ushers who would then pass them on to Jamie. But with something like 2000 people there and just 90 minutes, Jamie barely scratched through the surface. Which was frustrating – I could have listened to him for a couple more hours answering audience questions with his characteristic candour and cheeky playfulness. The one low point of the afternoon was ban on photography. The minute Jamie stepped on stage, flashes started going off left, right and centre and, not having heard the usual “no photography or recording devices” announcement, I figured it was ok to take a couple of photos. Without flash, bien sûr. I am used to not being allowed to photograph or record music concerts but I thought this was different and that they had allowed it. Ummm, apparently not. Our usher was having none of that. We were not even allowed to hold onto our cameras… After complying with her request to stop taking pictures (which involved flashing her flashlight along the row the minute you even laid a hand on your camera), I kept my camera in my hand so as not to make rustling in my bag sounds and annoy those around me. The usher stood at the end of the aisle with her flashlight until I actually put the camera away. Meanwhile, the rest of the crowd was merrily snapping away (with flash) with a very few ushers asking (but not insisting) they stop. I mean, don’t get me wrong – I have absolutely no problem if photos are NOT allowed but am perplexed as to why so many people were “getting away with it” in other sections. A consistent policy and a clear message would not have gone astray. Ok, so I digress! I am going to admit to being a bad food blogger here because after the usher kerfuffle, I actually wanted to sit back and enjoy the “performance”. I feel guilty that I didn’t “cover” the event as thoroughly as I would have liked to, but it was just one of those days when I needed to take off my blogging hat and put on my “I need to veg out on a Sunday and enjoy myself” one! Got some quotes for you though! Gardening can be a “profound” experience for children – you can even base your math, art, English and history classes around a garden and make the lessons really come to life. Find something they like – smoothies, bolognese sauce or soup, for example – and hide “the good stuff” in that! It’s transient – depends on where he is in the world (and in some countries, “you have to look harder than others.”) but right now it’s real Mexican and food “inspired by the native American Indians” which apparently have a lot of similarities. Chilies contain capsaicin which Jamie calls a “natural form of morphine”. Chilies speed up our metabolism by 25% according to Jamie. Jamie always “gets a rim of sweat on [his]nose” whenever he talks about cooking with chilies. A very fun afternoon; entertaining, thought-provoking and full of hope. Jamie truly believes we can act now to change the future for our children and, as he says in this interview: “If my buddies in Canada say we’ve got a theatre sold out of people who want to ask you questions, well, I’m coming, I’m turning up.” He seemed thrilled that so many of us are on the same page as he is – i.e. getting back to basics and eating real food. 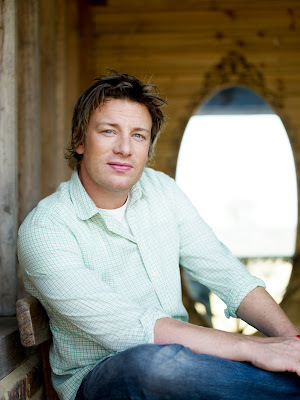 In Jamie’s words: “My book, Jamie’s Ministry of Food and the TV show are basically about inspiring people to get back into their kitchens and make simple, delicious food from scratch again. You can read more about Jamie’s Ministry of Food project here. And check out the book (that we received with the price of our ticket) here (US) or here (Canada). ← Gourmet Food and Wine Expo – the eats! Great read and great insights from Jamie. Thanks for sharing. It would have been great if you could have a photo of him too. Maybe next time. Sorry, what I meant is – a photo with him. Love Jamie Oliver! Missed him in NYC when I was in SF for the Foodbuzz festival, but hope to meet him one day. I love that he uses his celebrity for good in trying to modify cafeteria food with healthy options for the kids. Great recap! Love the quotes you captured for us! what a fun event – I have always liked him. Anyway we are having Thanksgiving here in the lower half of your continent so wishes go out to you and yours! How did I miss this, Mardi? Was this part of the food expo? I'm a big Jamie fan since his Italy tv show. So sad I missed this one!! Thanks everyone – it was a lot of fun! nice snaps he is awesome and a credit to Great Britain!!!! Hurrah for Jamie! Being part of the Local Authority that he pioneered his School dinners programme in I can honestly say that for the best part of a year I stalked him around our Primary schools – or at least he was always there filming when I turned up to do some work!!! After tyhe programme there were adverts in the local papers for school meals supervisors -the queue for application forms went out of the town hall and around the corner. Not sure the momentum has sustained but we do now have legislation on the quality of food, types you can cook and quantities of salt in school meal provision. However having worked in the Primary sector for more years than Jamie has been cooking I've never known a school that doesn't grow something!! Oh a PS – I delivered quick roasted cod and chocolate pots to 6 happy diners on friday evening courtesy of our Jamie! Rebecca (Chow) – yes he is a credit to his home country! Cathy – ooooh a Jamie stalker! I would have totally been there with you too!! That's so great that your schools are gardeners too! And send some of that cod and chocolate pots over here will you! thanks for reporting – loved reading through his comments!